Need a Quick ChIP Fix? We've got you covered. 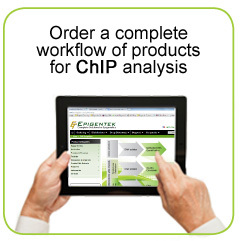 Satisfy your research needs with any one of our convenient ChIP kits. 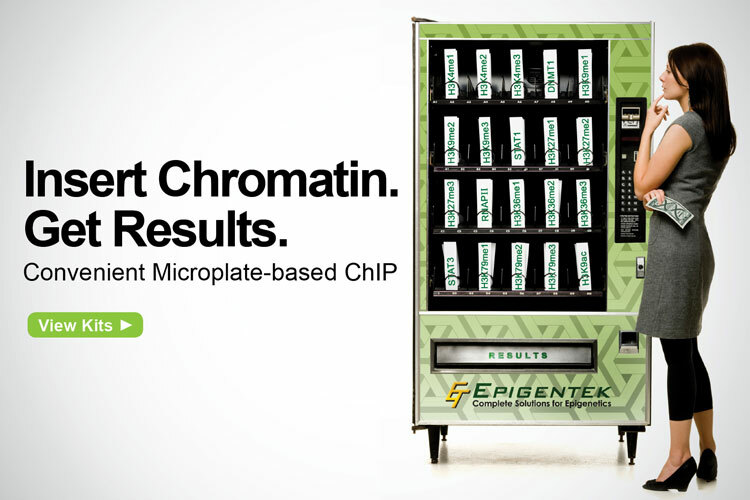 Epigentek debuted the microplate-based ChIP format in 2005, enabling rapid and low-cost immunoprecipitation of chromatin samples for epigenetic researchers. Each kit contains everything you need to reliably immunoprecipitate chromatin in a fast and efficient manner. A significant epigenetic process that controls gene expression is chromatin modifications. Studying chromatin (or fragments of the DNA-protein complex) allows researchers to specify the types of proteins present within a genomic region, understand how these proteins interact with DNA, and identify the nucleic acid sequence and structure needed to assemble these complexes. DNA-protein interactions within a cell are crucial for correct gene regulation. They can determine whether proteins such as modified histones or transcription factors bind to a certain region of the DNA in a living cell. Within the nucleus of a cell, genetic material is organized into a complex structure comprised of DNA, proteins, and some RNA. This structure is called chromatin and it consists of a repeating chain of oval-like units called nucleosomes. Each nucleosome represents about 146–147 bp of DNA wrapped around an octamer of histone proteins (histone 2A, histone 2B, histone 3, and histone 4). The specific degree of compaction of these nucleosomes at genomic regions influences the accessibility of transcription factors and other DNA binding proteins that are critical for transcriptional regulation. Genomic regions are identified as either euchromatin or heterochromatin, in reference to the arrangement of nucleosomes. Euchromatin (open chromatin) forms a relaxed structure with more spacing between the nucleosomes and is linked to regions where active transcription is taking place. Heterochromatin (closed chromatin), conversely, forms a tightly compacted structure and is linked to regions that are transcriptionally inactive or silent. To quickly quantitate euchromatin or heterochromatin status of your sample, Epigentek offers a 90-minute chromatin accessibility assay. 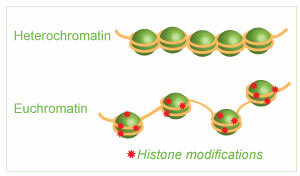 Read more about chromatin remodeling and histone modifications. Understanding the dynamic composition of chromatin can provide important insights into gene regulation, development, DNA repair, and epigenetic inheritance. Techniques used to study chromatin modifications include using modification specific antibodies in immunocytochemistry, immunohistochemistry and immunoprecipitation (as in ChIP). Once the specific chromatin of interest is isolated, ChIP-on-chip (microassay) or ChIP-Seq (next generation sequencing) methods can be used for a genome wide study. In addition, nucleosome positioning can be determined using a chromatin accessibility assay which detects regions of euchromatin (accessible) or heterochromatin (protected) within the genome by enzymatic means. The most common method for studying chromatin-related modifications is chromatin immunoprecipitation (ChIP), a process by which a protein of interest binds to a specific genomic DNA region. This popular ChIP assay provides epigenetic researchers with valuable information about the interaction among certain proteins or protein modifications and a specific DNA sequence. Protein-DNA interactions are crucial to certain cellular functions such as DNA replication and recombination, gene transcription, chromosome segregation, signal transduction, and epigenetic silencing. Understanding protein-DNA interactions can be used, for example, to compare the amount of histone methylation linked to a specific gene promoter region among two different groups, such as tissues that are diseased or healthy. 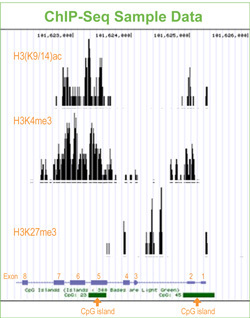 Chromatin immunoprecipitation methods can also be used to map the genomic location of various other histone modifications. With various downstream analyses, for example ChIP sequencing (ChIP-seq), which combines the process of ChIP with high throughput sequencing, researchers can identify the exact genetic sequence of a gene to which a protein binds in living cells. By knowing the genetic targets of DNA-binding proteins and their associated epigenetic mechanisms, researchers can begin to unravel the mysteries and nuances of cellular processes. View a comprehensive selection of chromatin research products that will cover every step of your experiment's workflow. For a more detailed explanation of the steps of chromatin immunoprecipitation and helpful ChIP tips and techniques, view A Starter Chromatin Immunoprecipitation (ChIP) Protocol or read the three-part series A Technical Guide to Conquering ChIP, by David Esopi, research specialist at Johns Hopkins Sidney Kimmel Comprehensive Cancer Center. 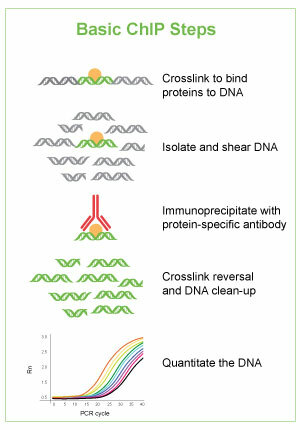 Crosslinking DNA and proteins is usually a required first step in chromatin immunoprecipitation (ChIP). While it is possible to perform ChIP without crosslinking, it is typically not recommended. This is because numerous protein-DNA interactions are transient and involve multiple protein complexes to coordinate a biological function. In vivo crosslinking covalently stabilizes these interactions for analysis. Formaldehyde is commonly used for crosslinking and is ideal for molecules that interact directly, including those of a transient nature. It’s important to note, however, that insufficient or overcrosslinking with formaldehyde can cause DNA loss or increase background. Formaldehyde incubation should only take a few minutes, after which glycine can be added to quench the formaldehyde and neutralize the crosslinking reaction. After crosslinking, more stringent condition can be applied throughout the ChIP procedure such as cell lysis and affinity enrichment. Isolate chromatin or DNA-protein complex from mammalian cells or tissues in a simple and rapid format using Epigentek's ChromaFlash Chromatin Extraction Kit. Also available for plants is the ChromaFlash Plant Chromatin Extraction Kit. Reducing the size of protein-DNA complexes in chromatin via fragmentation is essential for ChIP. Smaller DNA fragments can be pulled down and mapped closer to the regions of DNA bound by a protein of interest. Chromatin fragmentation will also permit protein-DNA interactions to be accessible in downstream applications. Also important is the method of fragmentation which will influence the results of your ChIP experiment. Because ChIP samples need to be compared, it is essential that fragmentation be reproducible and provide random sampling. Fragmentation can be achieved by either enzymatic digestion or sonication. However, the more preferable method is sonication since it can shear DNA more uniformly and as close to random as possible. 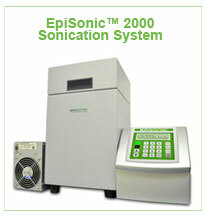 To ensure the best sonication results for your chromatin study, Epigentek offers the EpiSonic 2000, a multi-sample sonication system that can uniformly shear up to 12 samples simultaneously, generating consistent, reproducible fragments with virtually no sample loss. Choosing the right antibody to capture the DNA/protein complex is crucial for your chromatin immunoprecipitation experiment. Non-specific and inefficient antibodies could lead to the failure of your entire ChIP study while specific and high quality ChIP-grade antibodies can ensure proper immunoprecipitation and accurate results. Choosing between monoclonal and polyclonal antibodies for ChIP is similar to optimizing sensitivity and specificity in any application. Monoclonal antibodies, which are produced from a single B cell clone, recognize only one epitope on a target protein. They tend to have low background signals, high speciﬁcity with reduced cross reactivity, and perform more consistently from batch to batch. However, monoclonal antibodies may not be able to detect across a range of species and are may be more sensitive to chemical treatments. In contrast, polyclonal antibodies are produced from different B cells and can recognize multiple epitopes on the same antigen. They are less likely to be affected by changes in protein conformation and are highly stable due to their tolerance of pH or buffer changes. For these reasons, polyclonal antibodies are very successful at pulling down a protein of interest and are frequently used in ChIP experiments. There is a higher potential for cross reactivity with polyclonal antibodies, however this can be minimized through affinity purification. Sometimes, even careful pre-testing of your antibodies with Western blot, peptide dot blot, or a similar method does not necessarily tell you that the antibody will be suitable for chromatin immunoprecipitation. A researcher's best bet is to use antibodies that have been validated specifically for ChIP. To aid in your research, Epigentek provides an extensive line of ChIP-grade antibodies which are rigorously tested for specificity as well as their compatibility with downstream applications. If you already have an antibody and would like to determine if it is ChIP-grade, you can use a proper commercial kit, like the Pre-Sure ChIP Antibody Validation Kit to test it. In less than 3 hours, this kit allows researchers to gauge whether or not an antibody will successfully work in ChIP. Plus, the results are consistent with ChIP-qPCR and ChIP-Seq without having to carrying out a full ChIP experiment along with sequencing. Read more about how to validate your antibodies for ChIP in-house. DNA obtained through ChIP can be quantified by real-time PCR (Polymerase Chain Reaction). This laboratory technique uses an illuminating DNA-binding dye and a special instrument to amplify and detect targeted DNA molecules. This method is effective for analyzing multiple samples and cost less than whole genome sequencing. ChIP-chip (also known as ChIP-on-chip) utilizes microarray technology to generate high resolution genome-wide maps that can determine the binding sites of many DNA-binding proteins like transcription factors and also chromatin-related modifications. ChIP-seq (ChIP-sequencing) combines chromatin immunoprecipitation (ChIP) with direct sequencing technology to accurately analyze protein interactions within the DNA. This method can be used to map global binding sites precisely for any protein of interest. Sequencing offers higher resolution and less bias when compared to other methods such as ChIP-on-chip which is limited by its number of probes. Modern sequencing technologies can now cost effectively sequencing large amounts of DNA in a matter of days. Looking for assistance with your ChIP project? Let the experts at Epigentek help. View our comprehensive and accurate lab services for Chromatin Studies. Services include: ChIP-Seq, ChIP-qPCR, and ChIP antibody validation.